Prime Sawmill, located at Matawhero, just out of Gisborne announced this week that it will be closing its mill on Christmas Eve and "mothballing" the plant. This is a bitter blow for the workers, the company, the community and the forestry sector in the East Coast region. The mill, managed by Winstone Pulp International (WPI) and owned by Ernslaw One, has struggled with the downturn in the US property and construction market and the high value of the NZD. WPI stress that the mill is not being "scrapped" and should conditions change in the future, they would expect to possibly re-start operations. A team of four to six workers will spend several months in the New Year preparing plant and equipment for an idle period, protecting it from deterioration. This development comes just weeks after Hikurangi Forest Farms, a large forest owner in the East Coast region advised that it would not be progressing with its planned wood processing plant near Gisborne. This in turn jeopardises the rail link from Napier to Gisborne, which is currently uneconomic to run. "These are unfortunate and disturbing developments for the region", says Nick Bunting, PF Olsen's East Coast Regional Manager, based in Gisborne. "The region has already been very reliant on log exports but it's mainly been the unpruned logs. We expect with the closure of Prime, more volume will move to log export, increasing pressure on an already congested port. In addition, there is more volatility in price for export logs". Harvesting volumes are forecast to increase by over 50% in the next 20 years across the East Coast region (see chart below). With a dearth of new processing planned, and in fact wood processing capacity declining in the region, is appears that log exports will be the only option for the increased log volume. This has important implications for development requirements at Eastland Port. PF Olsen is working closely with the port authority and other forest owners to ensure that adequate capacity if provided to allow forest owners to get their logs to market as efficiently as possible. For more information on the challenges facing harvesting and marketing forests in the East Coast, see the feature article Big Challenges Getting East Coast Logs to Market in Issue 12 of Wood Matters. 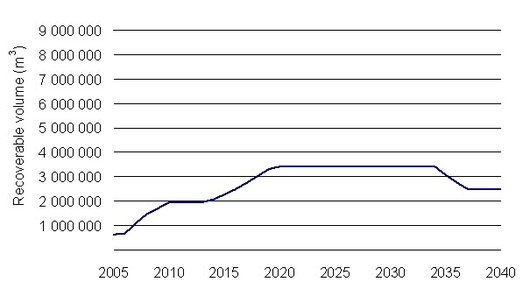 (source – MAF's East Coast wood availability forecasts for period 2007-2040).